On Friday nights Belle and Bad Boy usually close the work week with a casual meal out and then a little grocery shopping for the week ahead. Last Friday was just cool enough to start thinking about oysters. I had read about the Full Moon Oyster Bar, a small North Carolina chain with locations in Clemmons and Southern Pines, opening on Monday in Morrisville. Bad Boy was all in at the suggestion to check out the Full Moon Oyster Bar. When we stepped in the door, I wanted to shout “woo-hoo!” Here was a true oyster bar – no tables, just a long bar running around the inside with shuckers serving up raw and steamed oysters from behind the bar. Just like the oyster bars from my younger days, the Full Moon Oyster Bar makes you feel like you are at one of your favorite hangouts. 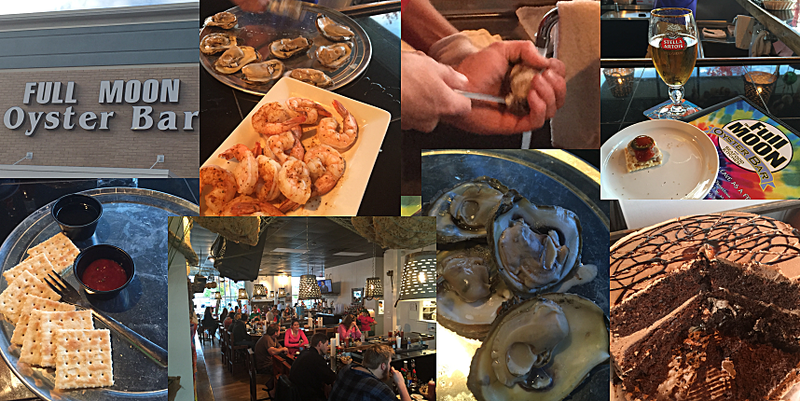 As Randy Russell, the owner, says, “Come as a stranger, leave as a friend.” Everyone is extremely friendly with a “hello, can I help you, or have you tried.” The staff is not only friendly but very knowledgeable about the menu and the many varieties of oysters available. 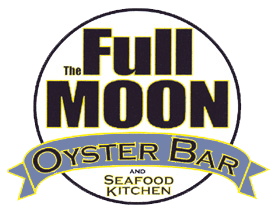 At Full Moon you can choose oysters from the waters of the Gulf and Atlantic Shores. Just ask Jonas Glascoe, manager, about the different varieties. His descriptions of the different oysters are so good that you can almost taste them. During our visit we had the opportunity to meet and talk with Randy and his wife. In just a few minutes, we saw how passionate Randy is about The Full Moon Oyster Bar from the quality of food to the quality of service. Randy also explained, “Fresh oysters are best prepared using hot steam to preserve the salty goodness.” He took the time to tell us the history behind the Full Moon Oyster Bar as well as talk about the menu. He enthusiastically pointed out a couple of items he thought we should try such as the Quarter Moon appetizer and a slice of one of the home made cakes for dessert. It took just a minute for us to make our selections. We decided to start with the stuffed mushrooms followed by a steamed combination of oysters and shrimp. Taking Randy’s suggestion into consideration, Bad Boy decided to also try the Quarter Moon. Now, the Quarter Moon is a house specialty featuring a raw oyster on a saltine cracker with jalapeno, horseradish, black pepper and hot sauce. If you eat four of these you can say “you shot the full moon.” This feat also earns you a tee shirt. As we were ordering Jonas, the manager, stopped by and after hearing Bad Boy had ordered a Quarter Moon, he offered a couple of pointers on how to eat it. Jonas also pointed out the nice selection of craft beers they have on tap and offered some suggestions once he found out our taste in beer. We definitely enjoyed the “Full Moon Experience.” The atmosphere and service was great, the staff friendly and knowledgeable, and the food was prepared “just right”. Thanks to Randy and Carol, Jonas, Ashley, Chelsea and Terri Lynn for a great experience. We will return!